Traditional designs are many times inspired by careful observation. Each Tribe, band, community's designs are unique to each ones original geographical region. Those places, sights, moments in time, filled each of our relations with the desire to reflect and continue that felt beauty. Today, we each have the opportunity to step onto those traditional trails and seek out our own inspiration from a traditional cultural heritage. The waters, mountains, wind and stars are still there. The optimum experience is many times the most enriching on- many levels. This will often go beyond the instruction by your favorite relative or tribal artist. If this traditional path is at all possible, by all means respectfully make your interest known. This is a good time to mention three "friends" who need to be a part of this activity: sincerity, dedication, and respect. Your work and success will reflect how well your "friends" enjoy your playtime. Yes, I mean Play in the purest, most wonderful sense of the word. Fun, joyful, happy, satisfying feelings as you do beadwork. For many this will begin with the first attempts, others need to try to master the basics with repeated practice. As with many fond activities (sports, knitting) time is not even in the ballpark when we are having fun. Time is only measured by your feeling good about the activity and the success of the experience. There is no "Clock time" when we are having fun. This decorative technique has been in use over two hundred years in many regions of Indian country. Earlier times, quill work rows or lanes of design were part of traditional tribal design and decorations. For many years this style has been labeled, by the uninformed, as the "lazy stitch". As you look at it and attempt the technique, you will soon agree there is nothing "lazy about it". In appearance they do indeed look like lanes or rows of beadwork. 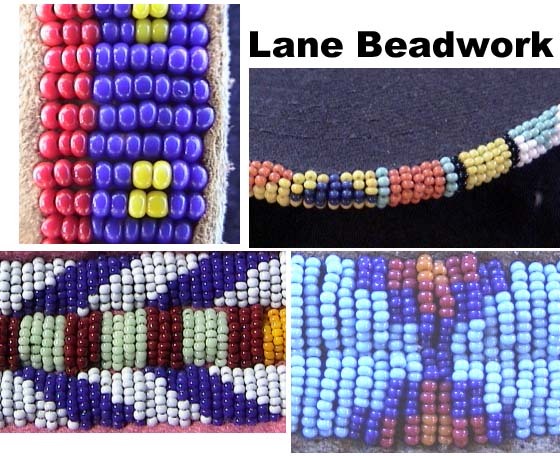 We will bead a lane of sixteen sewn stitches of beads, seven beads wide. This lane will consist of a traditional basic background, color: white, light blue, red or green. These lanes will be applied to 3" squares of felt as many times as necessary to gain confidence in the technique. We will introduce three design elements: vertical line (stitch), horizontal or 'running' line and the diagonal. (A, B, C) These three elements, with slight variations, will produce a vast majority of designs. Good beading !